A girl originally from Charleston, South Carolina- living in Houston, Texas and MARRIED TO a boy from Dallas. Our life, stuff we're interested in, funny stories, recipes and pics! Last weekend we went to dinner with our friend Debbie who lives near a Pier 1. I had a few Christmas ideas I needed to check out, so we went in. Well - they have gone owl crazy like everyone else! I love them! 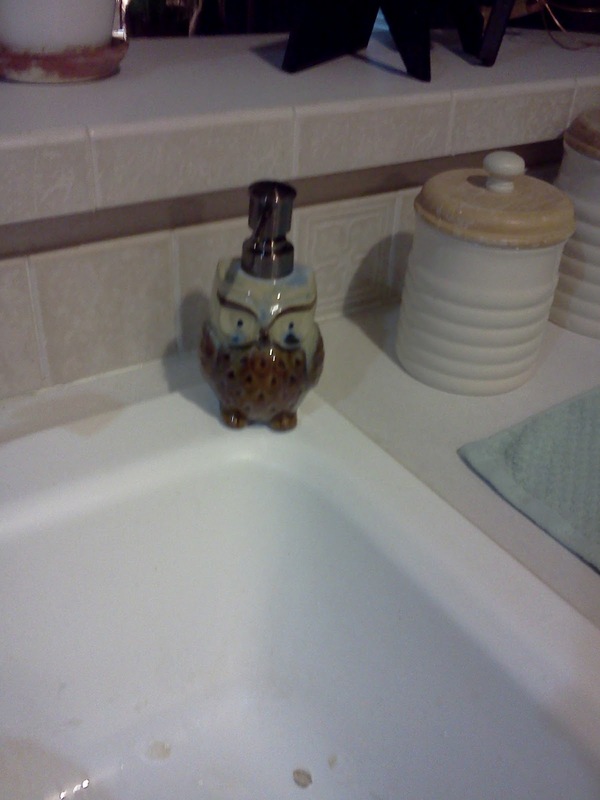 I don't really want to start collecting owls. I just think they're cute. I want some placed here and there in the house but not everywhere. I'd like some owl jewelry ... maybe a pillow or two. 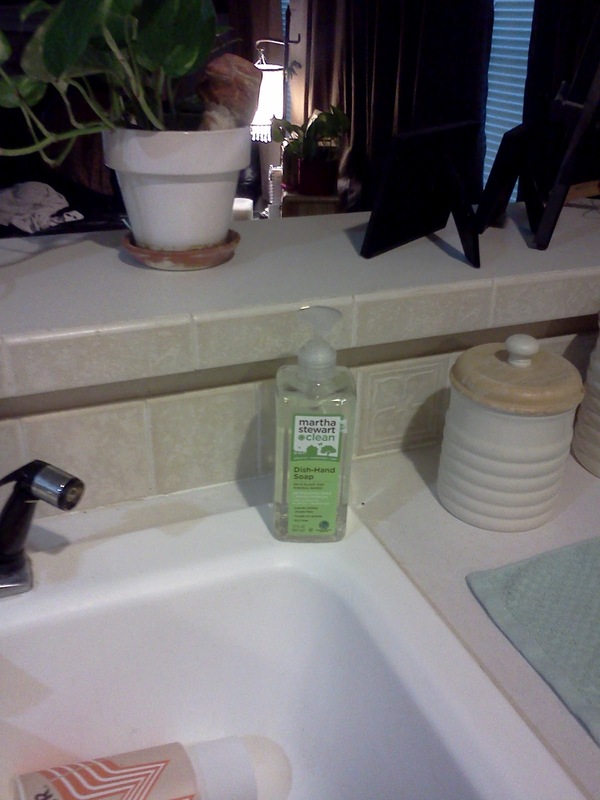 Well this was my sad sink (and it IS sad, I have been asking Conrad to PLEASE replace it!!!!) before Pier 1. 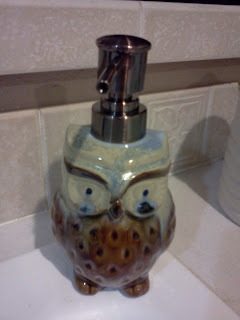 I picked up this guy at Pier 1 for $12.50 and it was worth it, cause he makes me smile. Now my sink doesn't look AS sad ... but it still needs to be replaced! Too bad Conrad doesn't read my blog. Drain the fat, back in the pan: add salt and pepper to taste, about 1/2 tsp of garlic powder and 1 8 oz can of tomoto sauce. Let this simmer for 5 minutes. While this is simmering, put your drained noodles in a large bowl. Add 1 cup of sour cream and 1 cup of cottage cheese. (you really can NOT taste the cottage cheese, but if you're too ooged out, you can use ricotta here or even cream cheese, softened). Stir the noodles, cheese and sour cream together. It was SO good- I can't even wait for tonight because the leftovers will be even better. It was easy and it was a cross between spaghetti and a lasagna. We both thought it was fabulous. We can get tired of the same ol', same ol. I am a super big fan of broccoli cheese casserole or broccoli cheese rice. Love both of them! Sometimes though you just don't have time ... or you just need a change. I found a recipe on Pinterest I found interesting. 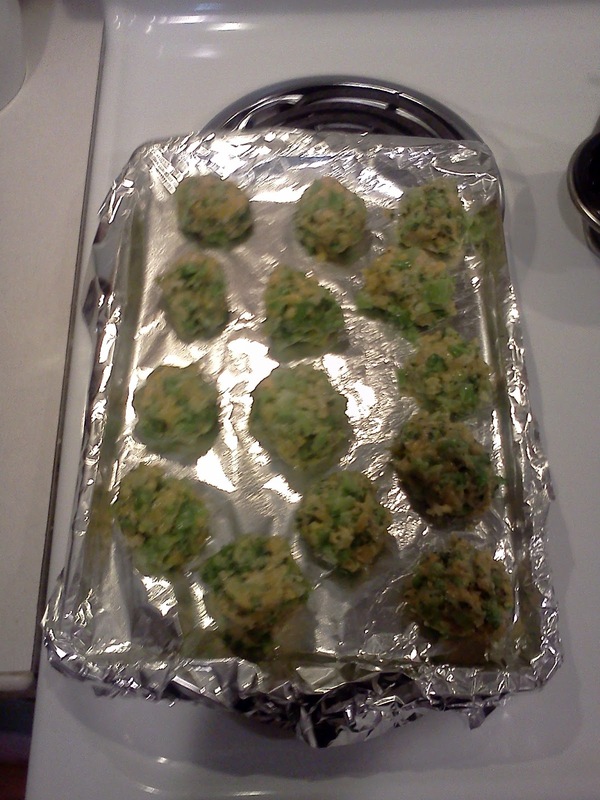 The recipe called really for FRESH broccoli, cooked and chopped into miniscule pieces. Well, I had a bag of frozen (12 oz.) that was already hacked to pieces. I went with that! So yeah, SUPER easy. Throw all ingredients in a bowl and mix together. Bake for 10 minutes, then flip them. At this point they won't look like balls really anymore. They will sort of have browned up and spread out. They aren't the prettiest things in the world, but they are GOOD. Here was the finished product after I had started serving. Excuse the ugly pic! I suggest greasing your sheet big time, or not using foil - they were sort of sticking to everything. NOT pretty, but still good! This is really good and very different. It was easy, it took absolutely no time at all and we enjoyed something different. Sometimes your side dishes can get boring too. If you wanted them crunchy, then perhaps after you roll into a ball, you can dip them into Panko breadcrumbs. I will be trying that next time! I know. They are adorable. I wore them yesterday to work with my jean capris. 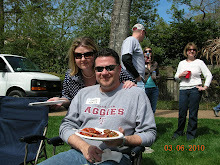 They brought in Goode & Co. for a hamburger/cookout luncheon. I totally looked festive. So ... you know I love Pinterest, right? I created a board called "Stuff I Want for Me" ... and I just keep ideas of things I see there. Like ... kitchen gadgets I want, shoes I like, a necklace, etc ... I mean, what if someone asks me what I want for my birthday? I need a place to refer back to. 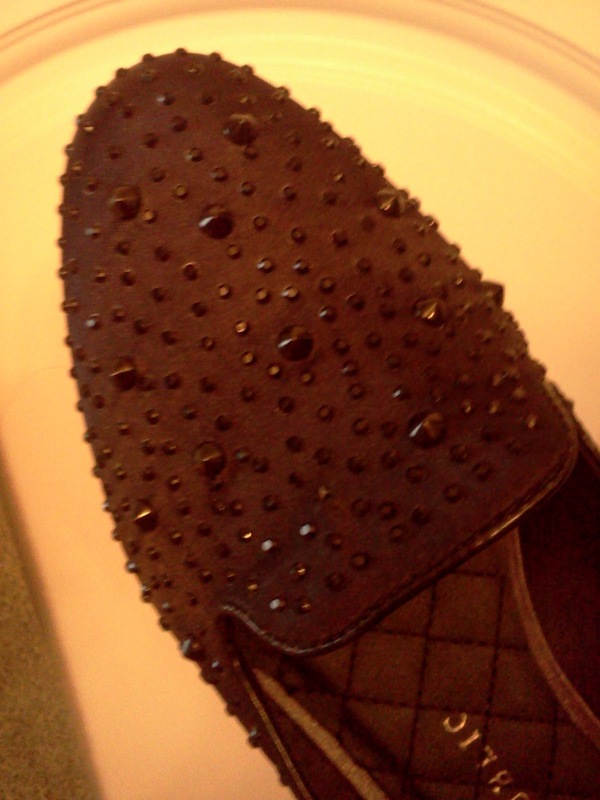 Well I had a pair of shoes on there that I really liked - black flats with spikes all over them. They are by Sam Edelman and are $150. OUCH -but they are so unique and spikes on shoes seem to be all the rage. OH, I LOVE SHOES. I don't know when I would EVER spend $150 for these shoes, but ... we can dream right? Well this weekend I stumbled upon a VERY similar pair at Kohl's. I was there to shop for my dad's birthday and saw the clearance sign. I wandered over, and there they were. They were a vast improvement on price, at $69-- but still too steep, but OH - they were on sale for $20! ... and WHO HAD A COUPON? ME. 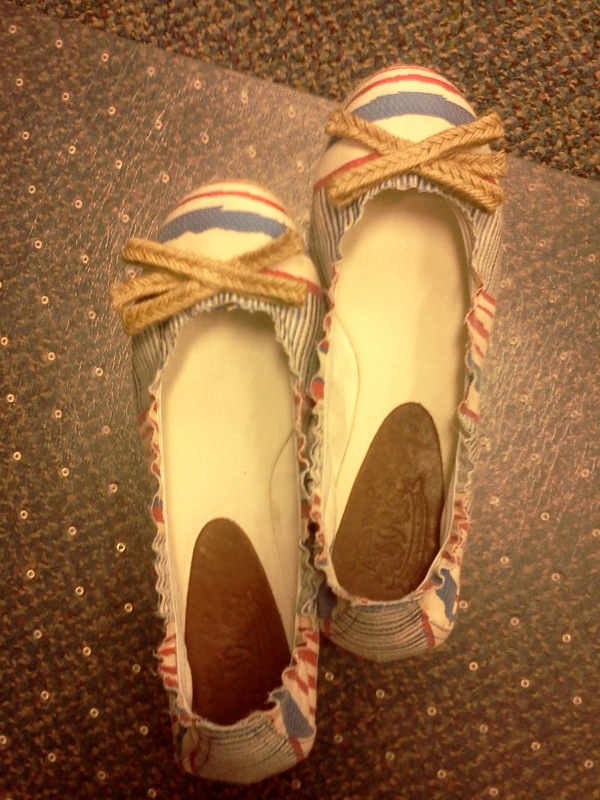 So I walked away with VERY similar shoes for $10. I mean WHAT? Sometimes it is TOTALLY worth waiting. 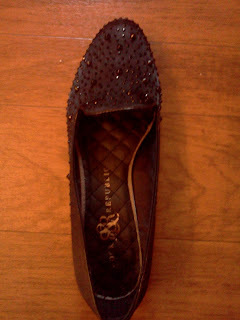 I needed a new pair of black flats anyway... and I can't even REALLY tell the difference. Love them! LOVE LOVE LOVE - and like my grandparents before me, I LOVE a good deal! Bless my soul! Today's garage saling was good times! I haven't been in probably a year ... maybe a little less. It's so hot ... I don't want to get up that early and lately, I've been going to a Zumba class on Saturday morning. If you follow me on Facebook, you know that Blanca has not been herself and we have been having a TIME with her. It has been frustrating, expensive, upsetting, etc ... I lost my will to Pinterest, cook, blog, garage sale ... basically I went to work, came home, cried and then went to bed. Finally though .... I have gotten myself together and Blanca seems better. So this morning I got up and headed out. --- these baskets came from Pennsylvania and were 50-60 years old. The lady selling them said they were from her mother in law's fruit cellar. They are very old, very nice ... and priceless to me and her. She said she has kept a bunch of them and the mother in law is long gone- but she just treasured them and had no more room for them. I think the finds of the day were the dressmakers form and the erectors set. Then again, the purses were cool too. I don't know, it was a nice haul and I got way more in merchandise than I paid for. It was a REALLY good day. Only took 2 hours and I was back home with all my treasures! I sure have missed garage saling! Sorry for the absence ... just have not been feeling the blogging! I am addicted to Pinterest, which frankly would not exist without blogging! So, last weekend I made picadillo empandas. 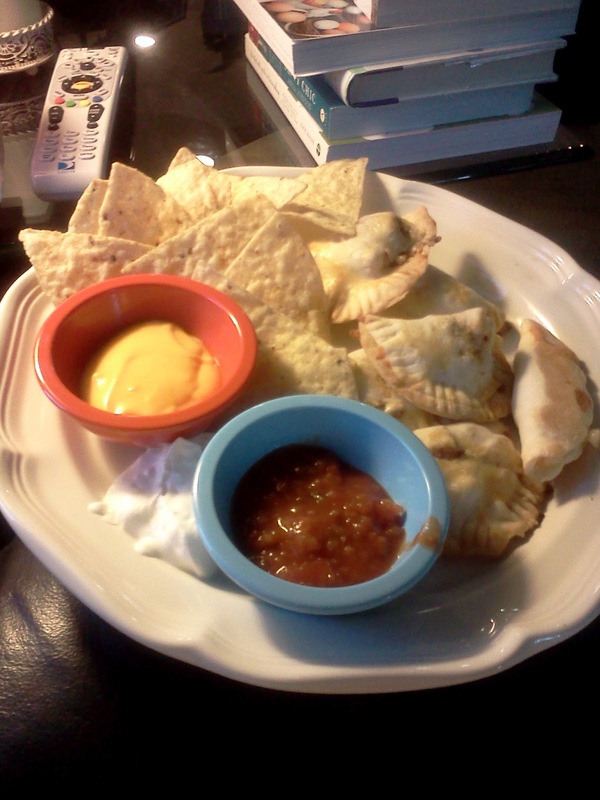 ANYTHING wrapped in pie crust is delicious and I love them. 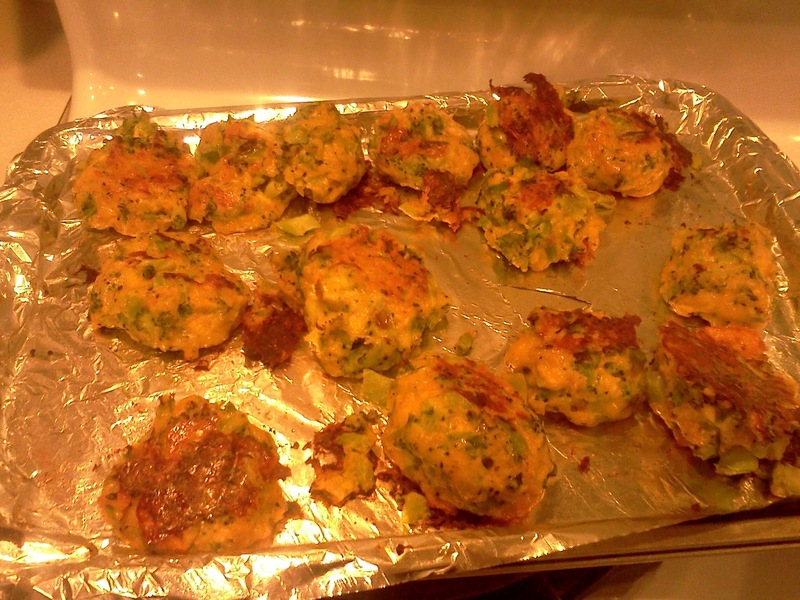 I made these in the oven, not fried, so they were pretty healthy. 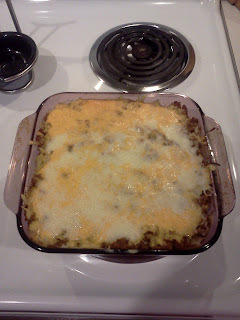 You can sub my ground beef with anything - chorizo, ground turkey, chicken, etc ... I am just a huge ground beef fan. If you're not familiar with Mexican food, you may not know what picadillo is. It's actually just like taco filling but with little diced potatoes in it. I LOVE IT. All the best restaurants in Austin use it. I've even had it on nachos before. So, I made these for the first time and they are NOT pretty --- I used a box of that rolled out pre-made pie crust ... and I used my biscuit cutter. I used the smaller cutter and I should have used the larger one. 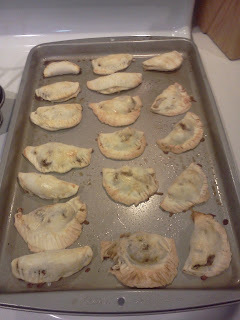 So these were busting out of their little pies, but it didn't hurt the flavor. Just doesn't look beautiful! Brown 1 lb of ground beef (or use the subs I mentioned) with 1 diced onion. Once that is browned and onions are translucent add 1 garlic clove, minced and 1 or 2 jalpenos, minced. Give this a few minutes and then add 1/2 cup of water, 1 can of diced tomatoes (I used fire roasted), 1 tbsp of chili seasoning, 1 tbsp of cumin, salt and pepper to taste, 1/4 tsp of cayenne pepper AND ... 1 russet potato, peeled and diced into small squares. Put the top on this and simmer 30 minutes. Roll out your pie crust on some flour and use a glass or biscuit cutter to cut out your rounds. When your picadillo is ready - fill the little round about 1/3 full and add a pinch of shredded cheese. I used monterey jack. Use some water around half the circle and close the little pie. Use a fork to crimp the edges. Bake these for about ... 15 or 20 minutes. Oh, I also gave these a light egg wash before I baked. DELICIOUS. 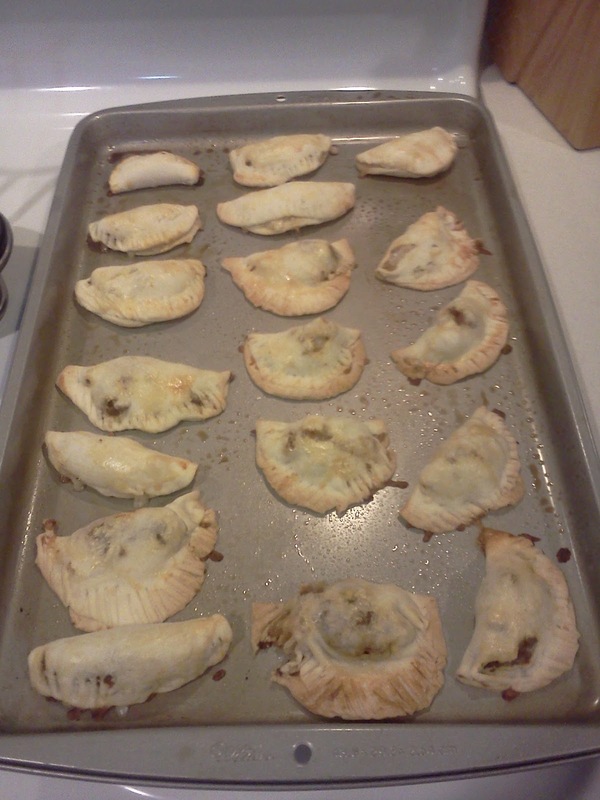 This picadillo recipe was enough for all these empanadas, tacos the next night, 4 more larger empandas for 2 days of lunches AND I froze enough filling for probably 4 more emapandas. CRAZY. Talk about a money stretcher! Dinner was great. Little sides of sour cream, salsa and cheese .. with some chips. It was the perfect dinner and Conrad liked it too! We'll be making again. Also, they were GREAT heated up in the microwave for lunch the following week. Free printable labels & templates, label design @WorldLabel blog. Open Source and more!